When it comes to printing your memories, you want to create something that preserves the moment, something meaningful, and still personal. Finding the perfect gift for the ones you love or creating a memento of happy smiles to remind you of a special point in time are an important aspect of preserving memories. Searching online for who prints the best photos? When you want to get your memories printed, quality is important. Mailpix uses Real Silver-Halide paper to bring the colors and contrast to life in each image for the best printing results. With a wide range of sizes and photo paper options, you can transform your best moments into stunning photos to preserve them for years to come. 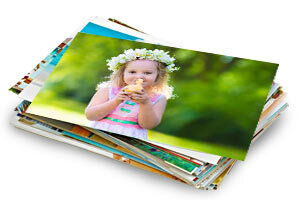 Even better, MailPix is the cheapest place to print photos! Upload dozens from your phone, fill up your album, or share your best photographic treasures with friends and family at the lowest prices online. You have the option of printing on small sized prints that can easily be used for scrapbooking, traditional size prints for framing or enlargements and poster sized prints perfect for decorating empty spaces or gifts. You may even create your prints using the digital sizes perfect for photo prints from iphone images that may not fit correctly on traditional size prints. Maybe you want to give the image a more eye catching glimmer than the traditional glossy finish. Order photo prints with a metallic finish to add richer color saturation and crisper lines. Since Metallic Prints are printed on Kodak Professional Endura Metallic Photo Graphic Paper, you will add a striking finish to your favorite memories. Need photo prints in an hour. Our Walmart Photo App can be downloaded free to your iPhone or Android device! Order cheap 4x6 prints, 5x7 photos, and 8x10 enlargements right from your phone or tablet. You can customize your cropping for each print and then choose where to print pictures convenient to your home! We offer 1 hour photo printing at over 18,000 CVS, Walgreens, Walmart, and Duane Reade stores nationwide! If you are looking for a way to transform your images into Professionally Wrapped Canvas we can help with that! 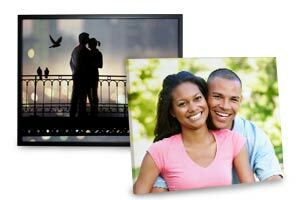 Creating Photo Canvas Prints will highlight your memories and draw attention to your home decor. With all the different sizes and shapes available, you will find something that works in the space you want to decorate. Each of our Professional Gallery Wrapped Canvases will add a dramatic and beautiful touch to any space. You will be able to choose your image and select from a photo- wrapped edge or a neutral colored edge to create the elegant, stunning look for your home. 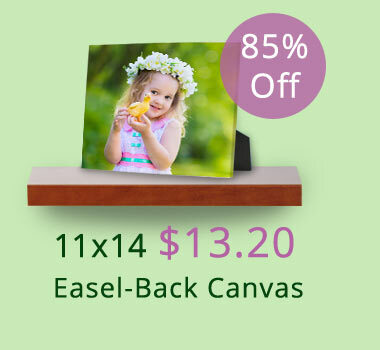 Set an Easel Back Canvas on your end table, a few Canvas Lites on the mantle and create a gorgeous Wide Wrap Canvas Cluster on that empty wall space of your family room. You may even want to create a collage canvas. Spreading the memories and reliving the joy with your family and friends couldn't be any easier. When it comes to keeping memories, things can get pretty out of control if we save them all on our computer or in dusty attic boxes. You have so many precious memories and special moments that you want to look back upon and remember. The best way to keep them organized is by creating a custom photo book for all those special times. Collect all the baby pictures of your kids and create a baby log of those tender moments. Create the Personalized Photo Cover book with professional hard cover binding to lay out on your book shelves or end tables. With many designs and layouts available to choose from you will be creating a unique and memorable photo book with all your favorite moments. Those adorable memories will be readily available to look back on at any time. Customizing is easy and simple to do. Organizing all those photos will turn your dusty photo boxes into recaptured moments you can reminiscence on at any time. However you choose to personalize your photo books, your memories are protected and enjoyed for many years to come. As the yearly birthdays and holidays come around, you want to customize the best looking card to get the biggest smiles from your loved ones. You can even personalize great looking invitations or announcements! Folded greeting cards are great for personalized wedding invitations and announcements or the holidays! If you want something with a modern yet simple touch, you may opt for the Double Sided Card Stock Cards. You can also create a Single Sided Photo Paper Card, great for the yearly holiday card you enjoy mailing to family and friends. Have a baby on the way? Choose from our variety of card sizes and styles and create a custom birth announcement. With so many options available, you are bound to find just the right greeting card, announcement or invitation for any occasion. Let every celebration turn into a fun set of memories. Everyone loves getting a customized greeting card! Whether it is given as a birthday card or as a simple thank you, cards are treasured because they stir our emotions and can be much easier to express how we feel about someone. They can also share the joys and smiles of the coming event or special date. With hundreds of styles and themes to choose from, you can celebrate the seasons and share the milestones with the people you love. Photo Calendars can be the perfect way to enjoy your favorite memories year round. Decorate each month on your calendar with your favorite images using a spiral bound hanging calendar! Each vacation, any holiday and every celebration can be turned into a gorgeous customized monthly calendar for you to enjoy year round. You may wish to use either a single photo layout or multi-photo layout to showcase your photos. Both layouts can be printed on either the classic 8.5x11 or the 12x12 Square Photo Calendar perfect for the fun Instagram prints you created throughout the year. With many layouts and designs to choose from, you could create a fun, yet functional display all year long. If you prefer the single page photo calendars to quickly look ahead at the year, you will love the 8x10 Single Page Calendar. Printed on high quality photo paper, it is the perfect size to hang in your office or mount to your fridge. You may also wish to create a stunning 12x18 Calendar Poster to keep track of your days. Perfect to see upcoming events and appointments in the coming months while enjoying the memories you created with your family and friends. Enjoy your treasured moments all year long with a Personalized photo calendars. Looking for gifts for your loved ones to enjoy is a unique experience with all the products available here at Mailpix. With so many items to personalize with your memories, every custom photo gift can be unique and one of a kind. Your family and friends will enjoy seeing their loved ones on their morning coffee mug, on their office photo mousepad or even when they cozy up in bed. Creating gifts for your loved ones is as easy as choosing the item you want, uploading the images you want printed and adding any text or adjustments to the project. The most challenging part will be choosing the images you want to use since you have so many fun memories to share. Build your own set of personalized photo coasters to spice up your home decor or make your own jigsaw puzzle for a unique holiday gift. Our wide selection of options are perfect for any part of your home or as a gift for friends and family alike. Create your own set of fun Ornaments for the holidays and accessorize the season with your treasured memories! Perhaps you'd like a customized Photo Apron to give mom on her birthday! We have something ready for you to personalize for anyone on your gift shopping list. In need of a professional looking banner that will capture everyone's attention? Looking for unique stunning ways to create conversation pieces on your wall? Display your most cherished moments and grasp people's attention through gorgeous displays created by you. Anything from Vinyl Banners, to Peel and Stick Wall Prints can be custom printed with your favorite photos. Do you have your own small business and are looking to advertise? 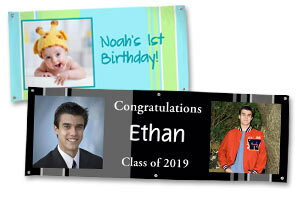 Build your own customized professional retractable banner complete with your own photos and text. Each of these items will showcase your very best images in the professional quality you are looking for. 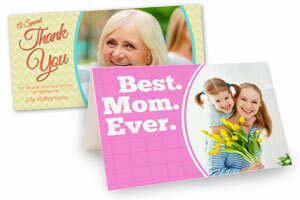 Mailpix is proud to print your memories on your favorite products. We also want you to get the best deals and prices! We are constantly looking for ways to provide you with new special offers and promotions. Don't miss out on the next discount and get the updates sent straight to your inbox!